I was inspired to go to a local Hospice. I went into the building, not sure if I was in the right place, and finding the directory, I found where I needed to be. Coming out of the elevators, I saw a chair and sat down. To my right what looked like a sheriff standing guard outside one of the rooms. There was a middle aged woman talking to him. It was obvious that something very serious was happening in that room. I stood up and took out my Rosary and began to pray the Divine Mercy for the soul in that room. As I was praying the Divine Mercy, some people came out of the room that were crying, it was obvious that whomever was in that room had just passed away. They hugged, and cried, and consoled each other, and then after some time, got in the elevator and left. After some time, a man with a gurney came out of an elevator and went into the room. I am still praying the Chaplet and after a few minutes the man came out with a body on the gurney under a blanket. 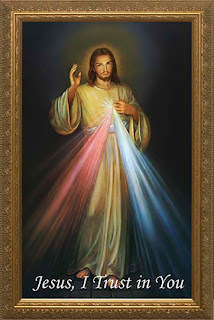 I began to pray the Divine Mercy out loud, but quietly. The man got in the elevator with his charge, and the doors closed. Just a few seconds after the door closed, a white haired man came from the left, he looked directly at me and with a malicious smile said , "...too late." I knew immediately what this was, and no...I wasn't too late. God had made sure of that, I was right on time. I do not know the result of my prayers, but I don't have to...I trust Jesus, and I know what St. Faustina said IS TRUE. Earlier, our Lord said to her, "At the hour of their death, I defend as My own glory every soul that will say this chaplet; or when others say it for a dying person, the indulgence is the same" (Diary, 811). There is absolutely no use in reading the writings of the Saints if we are not willing to put the knowledge given to use for the benefit of another. St. Faustina Pray for US!